Australian Marxist Journal Green Left Weekly has published an interesting article on Communist Party control of the Aboriginal rights movement. The left seems to now think that it is safe to take credit for their influence in movements which changed our societies forever. While vehemently denying it at the time, communists played the leading role in the US Civil Rights Movement, the South African anti-Apartheid struggle, the NZ Maori land movement and of course the Aboriginal movement of Australia. The communists took good causes and manipulated them in the interests of their Soviets masters. That they did much good along the way was incidental, but fortunate for all of us in the long run. It illustrates very well how a small, co-ordinated group of Marxist-Leninists can swing a whole country to their way of thinking. If you think those days are gone, consider the Climate Change debate, the Peace and anti nuclear movements and the Islamic radical appeasement campaign. Who do you think are manipulating those movements..the Boy Scouts? It is promised that the “honoured guests” of the ceremony will be the surviving members of the Federal Council for the Advancement of Aboriginal and Torres Strait Islanders (FCAATSI), the national organisation that spearheaded the campaign for the referendum. Unfortunately, it is unlikely that the real history of the referendum movement will emerge through the fog of official platitudes and cynical celebration: that the referendum, and its overwhelming endorsement by the Australian people, was the product of decades of determined political struggle by a “black-red alliance” — an Indigenous-led alliance of Aboriginal and Torres Strait Islander organisations with the left and labour movements. During the 1940s and 1950s, a series of struggles put Aboriginal rights on the national political agenda, and exposed to the wider Australian population just how severe the federal and state authorities’ racist restrictions were on Indigenous people’s civil and political rights. The most significant struggle of the 1940s was the epic 1946-49 Pilbara Aboriginal stock workers’ strike. In July 1944, WA CPA member Don McLeod reported to the CPA central committee that Indigenous leaders — including Clancy McKenna, Captain, Dougal, Dooley Bin Bin and Kitchener — were travelling from station to station preparing workers for action. On April 27, 1946, Aboriginal stock workers began walking off 20 stations. Police immediately arrested McKenna, Dooley and McLeod. Four-hundred strikers marched on the jail armed with crowbars and hammers, forcing McLeod’s release. The Committee for the Defence of Native Rights (CDNR) in Perth, led by CPA members, held several successful meetings, including a 400-strong public meeting. The CDNR galvanised support from trade unions, women’s organisations, churches and local authorities, as well as winning national and international support. In March 1949, as the strike approached its fourth year, police arrested 30 strikers. In response, Aboriginal workers walked off most of the region’s remaining stations, bringing the pastoral industry in the Pilbara to a halt. The Seamen’s Union in June banned the handling of wool from the stations. The CPA’s international connections resulted in the workers’ cause gaining publicity throughout the world, culminating in October 1949 with Soviet foreign minister Andrei Vishinksky denouncing Australia before the United Nations for flouting the Aboriginal workers’ human rights. As a result of the sustained pressure — it was Australia's longest continuous strike — the WA Native Affairs Department withdrew its support for the pastoralists. In the Northern Territory in the late ‘40s, the CPA-led North Australian Workers Union (NAWU) campaigned for equal wages for Aboriginal pastoral workers and backed strikes by Aboriginal workers living in Darwin’s apartheid-like “townships” — the Berrimah and Bagot compounds. Aboriginal NAWU organiser and communist Joe McGinness attended the 1951 Australian Council of Trade Unions (ACTU) Congress seeking support. NT and WA CPA activists collaborated with their comrades in the capital cities and in other states, as well as with existing and new Aboriginal rights organisations. More than 30 unions expressed solidarity with the NAWU, and financial support was provided by state and federal unions, trades and labour councils and the ACTU. 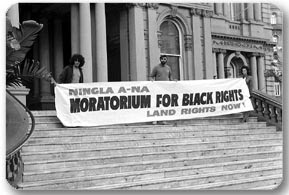 By the late 1950s, there were broad-based Aboriginal rights support organisations in most states. A number of key Indigenous leaders were members of the CPA and/or militant trade unionists. These included Faith Bandler, wharfie Chicka Dixon and building worker Ray Peckham, who were active in the Australian Aboriginal Fellowship (AAF) formed in Sydney in 1956, and Kath Walker (better known as Oodgeroo Noonuccal) and Gladys O’Shane from Queensland. Joe McGinness, now a wharfie in Cairns, was a leader of the north Queensland Indigenous rights movement (in 1961, McGinness became the president of FCAATSI). Non-Indigenous communists were also leading members in many state organisations, notably Barry Christophers and Shirley Andrews in Victoria and Len Fox in Sydney, together with left-wing Labor Party members, such as MPs Les Haylen and Gordon Bryant, as well as more conservative liberals and Christians. CPA-led or -influenced trades unions, including the Waterside Workers Federation, the Builders Labourers Federation and Building Workers Industrial Union, provided invaluable support. The actual launch of what was to become the referendum campaign was a packed meeting in Sydney Town Hall on April 29, 1957, where the AAF launched a mass petition drive calling on the federal government to hold a referendum to delete discriminatory clauses from the constitution and to take over the states’ control of Aboriginal affairs. One of the key architects of the petition, along with Bandler, AAF president Bert Groves and famed radical Jessie Street, was Christian Jollie-Smith, a barrister and a founding member of the CPA. The formation of FCAATSI at a conference of representatives of eight state-based Aboriginal rights and welfare organisations in Adelaide in January 1958 boosted the struggle nationally. FCAATSI adopted the AAF’s petition. Already thousands of signatures had been collected. In October 1962, another big meeting, this time organised by FCAATSI, “relaunched” the petition. Ninety-four separate petitions — 103,000 signatures — had already been presented in federal parliament. Shirley Andrews was the national coordinator of the petition drive. Campaign committees were set up in each federal electorate. By 1965, the campaign had the support of the ACTU and the Australian Council of Churches. The presentation of petitions by local MPs was now daily (even PM Robert Menzies had to table one from his constituents). The pressure was such that Menzies agreed to meet a delegation of Indigenous FCAATSI leaders. Nevertheless, Menzies and then Harold Holt continued to resist holding a referendum, in particular on amending the key section 51 to allow the federal government to make special laws for Indigenous people, and to override state laws. Between 1965 and 1967, even as the mass petition drive gathered pace, the Indigenous rights movement continued to mobilise. Two now historic struggles undoubtedly helped tip mass support in favour of Indigenous rights to such a degree that the government could no longer ignore the referendum demand. The first were the “Freedom Rides” through rural NSW beginning in February 1965, organised by Sydney University’s Student Action For Aborigines (SAFA). About a quarter of the white members of SAFA who joined SAFA president Charles Perkins on the historic trip were young CPA members. The action exposed the continued segregation and the appalling living conditions under which Indigenous people lived, in shanty towns and on reserves and missions, in country towns in the “deep north” of NSW. The trip was filmed by a TV camera crew and the graphic scenes of apartheid-like segregation and racist violence stunned the country. The second was the NT Aboriginal workers’ historic “walk-offs” in June 1966, led by the Gurindji people. The workers accepted the assistance of the NT Council for Aboriginal Rights (NTCAR), in which Communists George Gibbs and Brian Manning were leading members. Gibbs was secretary of the NAWU’s militant wharfies’ section, whose executive had a CPA majority. Manning was also a wharfie. Renowned author and CPA member Frank Hardy chronicled the event in his book The Unlucky Australians. That historic indication of the Australian people’s support for equality did not come from nowhere. It was the culmination of decades of hard-fought mass struggles by Indigenous people, their organisations and their allies — with communists, black and white, playing a leading role at every stage — which swung public opinion and laid the groundwork for the emergence of a new phase of independent Indigenous political activity in the 1970s, and to this day. In moral terms I cannot, I will not, sneer at those who support and give comfort to the oppressed. Aboriginal people are horrendously oppressed, no doubt about it. So I wonder about right-wingers and others who do sneer at, do vilify, Aboriginals and protagonists for Aboriginal people. The paradox of course is that the "vilifiers" are the very people who've either (a) acted so as to oppress, or (b) in the "comfort" of their not being oppressed, remain oblivious, advisedly so. Why should I take a lecture in "acceptable/unacceptable alliances", formed in the name of human rights and common justice. From the pompous "vilifers" for God's Sake ? They're complicit in the oppression. Often, as does this blog on this occasion, they invoke the specious ground that it's poison until the commies are rooted out. But still, they proclaim abhorrence of oppression. Yeah.....right ! And this in a rich, rich country. Koretake ! Just heard on the TV that the charlatan Tamaki, the self anointed "bishop", has proclaimed that people coming to New Zealand must accept (and revise their beings accordingly presumably) that New Zealand is a "christian" country. Strange, haven't noticed any Malaysian Muslims firing skud missiles at the doors of your "Amway" houses of "Amway" worship "Amway" Brian. Why you so hoha here baby ? Sorry to go off at a tangent Trev but probably the very worst thing in this world would be for that gelled-up charlatan, that exceedingly personally wealthy, homophobic, cargo cult peddling tithe winner, to be in command of anything in this fair land. Other than the ever-lactating cash-cows of 14 or so charitable trusts being the various Destiny churches. On the boards of trustees of which Bish' Brian personally has the power of veto. Now that is power ! I mean, I know he's never gonna be the main man - the pay's not good enough for a start - but do you remember the sweet fantasy he uttered about 4 years ago, that in 5 years Destiny Church (read Brian) would control NZ ? Stick to makin' money honey. And praisin' The Lord, or yourself, the 2 apparently being interchangable. We don't need your schoolboy religo-fascism ! You call it giving comfort Steve, I call it cynical exploitation. The hard left uses people, Steve. If they have genuine grievances great. If the have small grievances-just exaggerate them. Your racism and bogus commitment to ``liberty'' is showing, Trev. Of course those poor old darkies can't think for themselves, or act for themselves! They must be ``manipulated'', ``infiltrated'' and ``misled'' but ``outside agitators'' and ``reds''. These are the same claims made the racists and rightwingers of the 1950s and 1960s to oppose freedom and equality for Australia's Indigenous peoples. Why was it that it was only left that seriously campaigned with the Indigenous people, which backed their actions, and not those that shared your right-wing polices? I wouldn't put my name to such a silly comment either anon. The left is claiming credit for manipulating the Aboriginal cause, not me. The whole post is taken from a marxist paper. Marxists will manipulate anyone-workers, the elderly, the young, women, gays, "people of colour", Catholics, Protestants, Hindus, muslims etcetc etc. How is pointing this fact out by using the left's own words racist? You are being wickedly disingenuous there Trev. I've no big truck with Marxists anyway but the manipulation allegation is patently yours. Did you pick that up from Leighton Smith ? I remember that mutter from him years ago. How is it that right-wingers always oppose movements which often in very short time become standards ? I know it's something of a circular, non-answer but really, it's because we're right-wingers. Simple as that. That's what we right-wingers do. Only when we start to look ante-diluvian do we "profess" to embrace commonly accepted standards of respect for humanity. Hey Trev, I'm investigating that thing called ZAP. Will get back to you.